Looks much like Italian parsley, though much bigger and blooms with globe shaped flower heads. The root and leaf have a long history of use in traditional medicine, used as a remedy for coughs, congestion, digestion, rheumatism, and urinary conditions. In the culinary world, it is well known for its candied stems used in cake decoration, although they can also be steamed like asparagus. They are naturally sweet, pair well with rhubarb, and taste like licorice. Dried leaves can be brewed as a tea or used to flavour savoury meals. 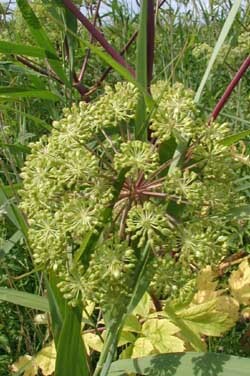 Angelica is a staple flavouring ingredient in liqueurs such as Benedictine, Chartreuse, as well as gin and vermouth. Sow in the fall and overwinter seedlings in a cold frame. Transfer seedlings in the spring to their permanent location and resist relocating once matured. Thrives in deep rich soil, in a dry shady location. You may notice that blooms do not appear until its second or third season and it takes this time to establish a lush bushy foliage base. Ht 24-36in (60-90cm); Spread 12in (30cm).